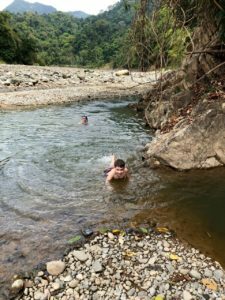 When planning a Costa Rican vacation with your kids, “glamping” probably doesn’t top the list (because the last thing my kids need is a glamorous camping experience…) but, as I recently found out during a stay at Rafiki Safari Lodge, maybe it should. On this 843-acre private reserve, you can stay in a permanent luxury safari tent. You can also watch birds, catch frogs, go whitewater rafting, horseback riding, hiking, or swimming — or travel off property to go on zip lining or kayaking adventures. I am generally suspicious of the use of Swahili words like “rafiki” where they don’t seem to belong (say, nestled deep in the jungle on the banks of the Savegre River of Costa Rica). However, the Rafiki Safari Lodge provides such an excellent and family-friendly ecolodge experience that I had to overlook the name. 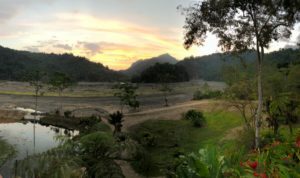 The lodge offers spectacular food and amazing service; we had only excellent experiences with both the employees and the owners, who readily available to give advice or provide anything we needed. The thick jungle surrounding Rafiki Safari Lodge. We rolled into this place after flying in to San Jose on a red-eye. It was not my best morning. One adult-who-shall-not-be-named forgot to get the car seat from baggage claim and had to go back through customs to get it; the kids were so overtired that they were giddily hitting each other with anything they could find while the other American tourists gave me the side-eye at the car rental office, and as usual we couldn’t exactly agree on which “small SUV” provided enough space to pack us all in. Needless to say, we were BEAT by the time we got here — and were thrilled to be greeted with cold juice and friendly faces. If you are like me, you had a brief seizure at the thought of flying 10 hours just to stay with your kids in a tent. But the tents at Rafiki Safari Lodge aren’t like any tents you’ve stayed in before. They do have canvas sides, I suppose…but each tent also has a deck and chairs out front and a large, comfortable permanent bathroom tacked on the back. (Large enough for a multiple suitcases to be emptied in search of swimsuits, which is critical.) Each tent provides plenty of room for a family to spread out. The resort even brought in an extra mattress when requested, without batting an eye. Why, yes, the view from the front porch of our luxury tent was pretty amazing. With ample wildlife, the tents allow you to hear every bird and insect. At least a couple nights of any Costa Rican experience should be spent so that you can go to sleep hearing the orchestra of cicadas and other insects and then awake at dawn to the birds cheering on the sunrise. On the flip side, the tents allow everyone outside to hear your children. Fortunately, the night we were there, the lodge had a large cancellation so there were few other guests to be bothered. If you have a baby who cries or any loud toddlers (do quiet toddlers exist? ), you may want to keep this in mind and request the most secluded tent. They also have a kids menu with items like chicken strips and hot dogs. I am now going to spend more words than is reasonable extolling the virtues of a children’s menu. While I spend large amounts of time and energy trying to get my kids to try new foods, the best time for that is NOT when they are jet lagged, sleep deprived, hot and in a new environment. Without the kids menu, that first day my kid’s meals would have been made up entirely of orange Fanta, mangoes, and pineapple (resulting in diarrhea and cranky children). I have never appreciated chicken fingers more. Swimming in the river was the highlight of our kids’ day. There are many more authentically Costa Rican eco lodges in Costa Rica, many of which offer mostly Costa Rican food, or casado tipico. But if you have small children who don’t seem particularly invested in trying local food — this place is perfect. 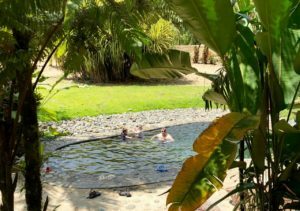 We go to Costa Rica because we want to visit places where our kids can explore nature, and Rafiki Safari Lodge is perfect for this! Frogs and lizards are everywhere, providing kids armed with butterfly nets the opportunity to catch little creatures. On the Waterfall Trail, we saw peccaries from a safe distance, leaf-cutter ants and an array of other insects. Bear in mind that the trails run straight up into the mountains and may be a little steep for kids under the age of five. Unfortunately, flooding from Hurricane Nate wiped out a chunk of the property bordering the river, but it’s still a beautiful place and you only notice the difference when shown pictures from before 2017.
swimming hole, and once we went there, we could see why! It is absolutely perfect for children. There is a small, deep swimming pool on the property with a water slide that probably wouldn’t be legal in the States, but gave the kids a thrill (I must’ve shot out of it at 20 mph), and also a sun-warmed “hot tub” adjacent to the restaurant. Depending on the age, this is a good place for kids to wander and explore, but bear in mind there are multiple bodies of water (the pool, hot tub and tilapia pond) so if you have a kid of drowning age (like mine) you do have to keep a close eye on them. The unique swimming pool at the Rafiki Safari Lodge; the waterslide is hidden by the foliage! Whitewater rafting, kayaking, fishing, birding and ziplining are all available while staying at Rafiki Safari Lodge, and they offer a variety of packages which include these activities. With their location right on the Savegre River, they heavily promote their whitewater rafting and it looks amazing! Unfortunately, the closest we got to rafting was admiring the rafts and life jackets with a jet lagged toddler in the early morning hours, but I am eager to take my boys back there when they are a little older. Roughly three hours away from the airport in San Jose, Rafiki Safari Lodge is a doable first stop on your Costa Rican journey. We chose to stay there as a stopping point on our way down the west coast to the Osa Peninsula. I was a little worried about finding it, but signs on the coastal highway clearly mark the unpaved road to the resort, which winds through palm plantations and involves a few well-marked turns. 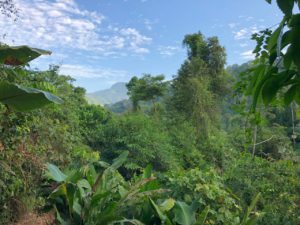 We were there in the dry season, when the trip was just slow and bumpy, but I suspect it would require an adventurous spirit to navigate in the rainy season (read: be brave and rent a 4WD vehicle). For those of you who would much prefer to let someone else handle this kind of drive, the lodge also has shuttle options. This isn’t the easiest place to get to nor the cheapest place to stay in Costa Rica, but with the gourmet meals included and the unique experience of being this close to nature, Rafiki Safari Lodge is definitely worth the cost and effort to get there. The owners have created just the type of unforgettable experience most families are looking for when they book a trip to Costa Rica.